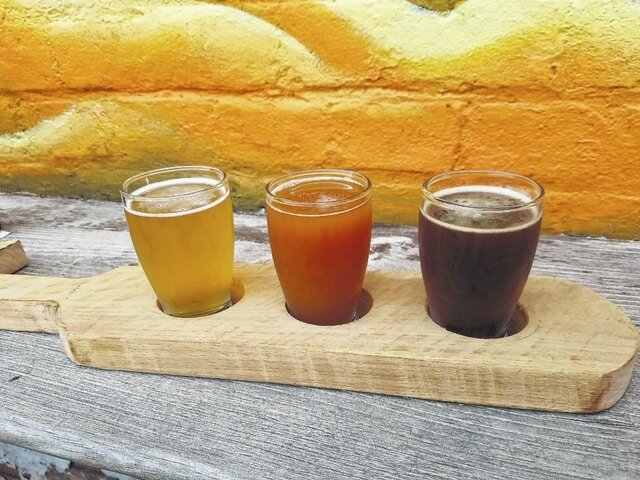 Guests can sample a flight of brews made by the brewery. From left: Zip Code, IPA, and Downtown Brown. Cliff Rhoads cuts the ribbon to mark the first day Pour Boys Brew House is selling their own beer. On either side of him are co-owners Mark Underwood (left) and Scott Hammond (right) along with many representatives from the City of Washington Court House, Fayette County Chamber of Commerce, and Travel & Tourism Bureau. Since Cliff Rhoads opened Pour Boys Brew House in 2014, his vision has always been to have a brewery. This past weekend that dream became a reality when he and fellow co-owners, Scott Hammond and Mark Underwood, hosted the tapping party for the first beers brewed at the 202 E. Court St., Washington C.H. location. “I’m excited and nervous,” said Rhoads. “The whole process has taken a year to get to this point. From remodeling the beer room, adding a walk-in cooler, buying the two barrels…we’ve invested a lot.” Currently the brewery has two fermenters that each hold 31 gallons. Rhoads and Underwood, the “Brewmasters,” released two “mainstay” brews and three R&D – Research & Development – beers for their guests. Downtown Brown, or DTB, is billed as a mild, slightly sweet brown ale with a chocolate aroma. The name comes from the building where Pour Boys is located, which was building 1874 and housed Brown’s Drug Store. The second mainstay brew is “ZIP Code” – a tribute to the farming community in the 43160 area. The house ale boasts locally sourced hops, light malt sweetness and a blonde color. The featured R&D brews are a Coffee Stout, IPA and Lyman’s Wheat Ale. Underwood’s grandfather Lyman had a wheat wine recipe which he modified into this beer. Rhoads and Underwood say the R&D beers are a way for the Brewmasters to express themselves and interact with the customers. “We will always have an R&D beer. We want the public to decide what they like and we’ll make what they drink,” said Underwood. As customers determine what beers they prefer, the owners hope to grow the business and eventually serve only the beers brewed at Pour Boys. The owners want the community to know that when they support the establishment, they’re supporting more than one local business. He has worked with a Fayette County hop grower in western Fayette County, Spanky’s Hops, to supply the hops for Pour Boys’ beer. https://www.recordherald.com/wp-content/uploads/sites/27/2017/01/web1_1232017PourBoysflight.jpgGuests can sample a flight of brews made by the brewery. From left: Zip Code, IPA, and Downtown Brown. 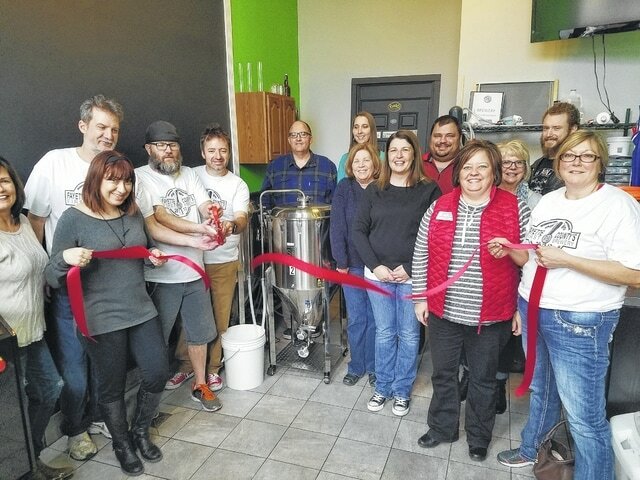 https://www.recordherald.com/wp-content/uploads/sites/27/2017/01/web1_1232017PourBoys.jpgCliff Rhoads cuts the ribbon to mark the first day Pour Boys Brew House is selling their own beer. On either side of him are co-owners Mark Underwood (left) and Scott Hammond (right) along with many representatives from the City of Washington Court House, Fayette County Chamber of Commerce, and Travel & Tourism Bureau.